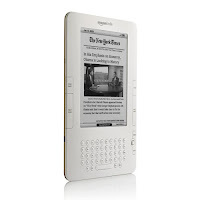 Kindle is undoubtedly a big advance and great achievement in the new technology creation recently proposed by Amazon.com. Previously people could just guess and pretend what an electronic book would look like. Many criticized possible creation of such devices referring to the devaluation of dead tree edited books. 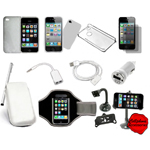 Nowadays opinions are sharply changing in favor of a new electronic gadget. Well, the biggest advantage of Kindle is that it proposes a great variety of books at any time. Furthermore its quality is equal to printable readability and even more, font size of the text may be changed to the wishful extent. It is convenient from the point that about 1500 books are stored in one device and thus more options for choice. While waiting for someone or something or during travel it’s a good opportunity to waste your time with such diversity in your portable book store. While reading you can add notes to the selected texts, use a dictionary in line when moving to a word and it’s much easier to turn pages by means of small buttons even being in uncomfortable situations. There’s no need to register manually and enter some additional data like e-mail, password or credit card. Once Kindle is switched on it starts operating automatically. But don’t forget that Kindle works on batteries. So the charger should just in case be with you. Although the latest edition is now able to operate about two weeks with the extension of reading one or two hours per day. It’s definitely a good solution for elder people but not yet ready for students. It’s inconvenient for reading non-linear content collections such as newspapers, magazines, travel guides, encyclopedias and other non-fiction books. Nevertheless this lack leaves a chance to the creators to improve it by embedding additional functions. And finally, it’s now possible to access the Kindle book store and some Websites wirelessly without the need of a Wi-Fi hotspot due to Amazon’s Whispersync technology e.i. you can connect over cell phone networks for free anytime it’s suitable for you. If you already are a happy owner of a Kindle you will be able to read our iPhone blog on it either.